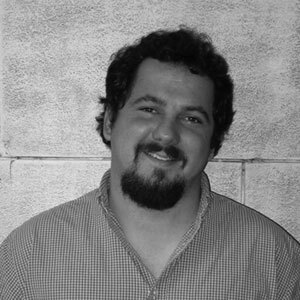 Tim Duggan, ASLA, is a landscape architect with the Make It Right Foundation. Learn more about the foundation’s innovative, sustainable landscape architecture work and see their “Kit of Parts” (4MB). The Make It Right Foundation was started by Brad Pitt, who wanted to help the residents of the Lower 9th Ward rebuild their community in the wake of Hurricane Katrina. Instead of rebuilding using conventional methods, Pitt asked William McDonough to apply his Cradle to Cradle approach to create a new set of sustainable homes. The primary goal is 150 affordable, green, and storm-resistant homes. How far has Make It Right progressed towards its goals? Make It Right was founded by Brad Pitt, William McDonough + Partners, GRAFT, and Cherokee. At that point, they were a little discouraged by the progress in rebuilding the Lower 9th Ward. This was two years after Katrina. So they collectively decided that sustainability should be dedicated more towards folks that need it, that affordable sustainable houses could have a much bigger impact. We set the goal of 150 homes. Right now, around three years out from project conception, we have approximately 50 houses completed and 30 houses under construction, all of which are under the LEED Platinum umbrella. We decided to strive for and reach that level for every home. This current build of 30 homes will be wrapped up mid-to-late February. We are then going to go through another round of analysis and value engineering to see how we can increase the affordability even further, without taking anything out of the systems of the house, the neighborhood, or the landscape. In addition to creating an affordable, sustainable, and safe set of homes, Make It Right also aims to re-conceive the role of landscape architecture in post-disaster rebuilding. A pilot of the Sustainable Sites Initiative (SITES), the Lower 9th Ward site aims to become an “innovative site sustainability platform.” What is this? How will the new site design model help mitigate against floods and storms while ecologically managing onsite water? How far along are you with these plans? Because Make It Right is not a developer, we’re simply building individual homes for folks that lost their homes during Katrina. We didn’t have the luxury of doing a comprehensive master plan. We had to look at the individual residential lots to see how far we could push the envelope of sustainability while still making them socially and economically sustainable. That said, addressing the site sustainability at each and every house led us to a bigger opportunity with the city’s Department of Public Works. We have been developing extensive low impact development strategies such as pervious concrete, rain gardens, rain barrels, and sub-surface water storage. Our landscape gets 65-plus inches of rainfall a year and the city of New Orleans still spends several million dollars pumping water over the levy. Our goal is to create a series of streetscapes that would invest in the public realm as opposed to just simply adding in a bigger pipe and a bigger pump. Make It Right foundation volunteers install a rain garden. By doing those early studies we were able to create a design team consisting of William McDonough + Partners, Walter Hood, Siteworks Studio, Diane Jones, BNIM Architects, as well as Make It Right to create a series of demonstration projects that would allow the City of New Orleans to develop new standards towards stormwater management. In the first engineering attempt we did, the final design alleviated approximately 350,000 gallons of water hitting the storm systems and pumping stations for every rainfall event. That’s 350,000 gallons of water on an eight block pilot street demonstration project. When we were able to quantify the cost of a gallon pumping water as well as the savings of keeping it on site, it became very clear that it was an economically sustainable model for future development. That’s one of the important things that we do on both the houses and the sites — we don’t actually take the strategies out of the project, we figure out a way to make the strategies more affordable so that they can move forward. Ultimately, to answer your question, right now we are currently in the final construction document stage of the project. It’s currently expected to go out to bid in late February and break ground in April. 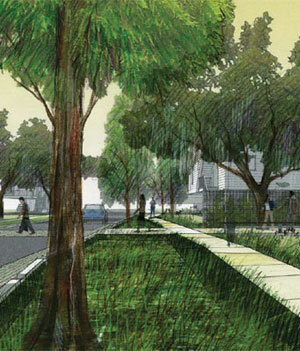 A key part of the site redevelopment work is creating new green streets within the neighborhood. The City of New Orleans has issued a contract with Make It Right to replace the streets in its area and has given your organization a $2.7 million community development block grant. The idea is to use this site as a test-bed for green stormwater management infrastructure. What are the goals of this green street test project? Will the city incentivize the spread of these practices if their benefits are proven? We call it the Lower 9th Ward Sustainable Infrastructure Project (9MB file). We collaborated with the Public Works Department on pervious concrete and stormwater management. It was very much a collaborative effort between William McDonough + Partners, BNIM Architects, Walter Hood, Pete O’Shea with Siteworks, and Diane Jones to create a series of models that would address water quality and water quantity issues and monitoring systems for short-term and long-term understanding of impact. It would focus a great deal on local workforce capacity and development. The ultimate goal was to create a platform to develop green jobs opportunities in the city of New Orleans. Jobs are the most important thing right now in our current economy, but they’re very much a major factor in decision making in New Orleans. While these new programs are expected to have a significant environmental impact, what about their local economic and social impact? Have the new residents of the neighborhood and local community groups responded to the new sustainable site plans? What do they see as the key benefits of the improvements? The residents of the Make It Right neighborhood are actually our biggest proponents. They immediately saw sustainability affecting their pocket books when their new utility bills came in at an average of $28 to $38, when historically they were $150 to $200. The idea that their economic sustainability is connected to their house is one we’ve tried to communicate, particularly as it relates to their taxes and the infrastructure within their environment. Lower 9th Ward Make It Right Foundation resident. We’re in a neighborhood that suffered great devastation. In fact, it’s about 100 yards from where the original barge broke through the levy and so water is a very unique constraint here. We have been collectively building trust together and identified means to show the impact in a metric that everyone can understand. It’s a metric of reducing one gallon of water. The reduction of one gallon of water within the landscape and public right of way is expanding to several hundred thousand gallons. It now has an economic impact that is a win-win situation for all parties. Looking beyond the planned 150 homes, your organization is also seeking to ensure the long term economic and social sustainability of the neighborhood. There are new green construction training programs, assistance for those purchasing the homes, and work with the Lower 9th Ward Stakeholders Coalition. However, your foundation says it needs five million to invest in community infrastructure and services, including a neighborhood store and permanent micro-farm. How did Make It Right determine that these were the priorities? How will these programs help ensure that the future success of a community? From the beginning, we have taken a collaborative, transparent approach that began with convening what’s now called the Lower 9th Ward Stakeholders Coalition, which is a group of community leaders, neighborhood association leaders, and local stakeholders. Everything we propose has gone through a review process and has received the comments of local stakeholders. Initially a local stakeholder instructed Make It Right to simply start building homes because they needed to bring back people into their neighborhood and that’s exactly what we did. Now, we’re seeing success and our trust and collaboration abilities are growing. The neighborhood has reached out and informed us that they’re looking at bigger and bigger partnership opportunities. A mixed-use development with a focus on a safe and healthy grocery store was one opportunity. One of those was also related to urban agriculture and addressing the issue of blight in New Orleans. The idea is to get productive use out of a lot that has been somewhat unproductive for the last few years. The last component that was proposed from the community was a better understanding of stormwater management in the wetlands landscape they live within. We’re just several blocks away from what’s called the Central Wetlands Unit that has been destroyed over the last 30 years by the petrochemical companies. These are the interior wetlands. Just recently the coastal wetland suffered from the BP oil spill. Any development we may pursue both in and around the neighborhood has really been focused on developing those facets. At the same time, we’re also seeing this as a positive model that can be both innovative and replicable. We’re looking for other opportunities with like-minded initiatives outside of New Orleans. 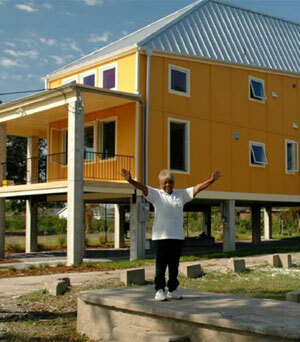 Another idea is to expand the Make It Right affordable sustainable housing model to other ravaged communities in New Orleans and even other cities like Newark. Is the new site model also considered as a likely export to other communities? How are those practices being designed and tested from the beginning for easy replication elsewhere? We are currently developing a long-term strategic plan within the organization, but collectively we all feel that this model works. The model of public private development that we have created here in New Orleans is very much a replicable model across the country. With rising sea levels and climate change and the need to completely rethink the way we’re handling our housing, landscape, and infrastructure, we feel we’ve been very successful. There are quite a few cities that we would like to collaborate with and think could benefit from that collaboration. Newark is the first site of a new collaboration — we partnered with Help USA, William McDonough + Partners, and GRAFT to create a 56-unit multifamily housing project that is mixed-use. More than 25 percent of its occupants are disabled veterans. The site program incorporates healing processes through innovative urban agriculture and horticultural therapy. There are also alternative energy and green roof technology components. The model is working so far. We should break ground by the end of January on the project and we’ll see where we can where else we can take this model. 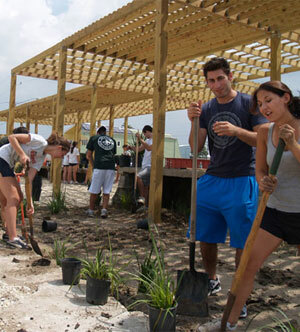 Lastly, what has the experience shown you about the role landscape architects can play in post disaster reconstruction? What has worked well and less well while working as part of a broader integrated team in post-disaster New Orleans? What are the key lessons for other Hurricane Katrina reconstruction, and now oil spill cleanup work? I’ve been in a unique situation — I came from working in the town of Greensburg, which was destroyed by a tornado, to coming down to New Orleans a few years after it was destroyed by Katrina, and then even given the opportunity to go Haiti a few times post-earthquake. I think the biggest lessons learned is to be proactive instead of reactive in those situations. There’s a fine line between emergency recovery and rebuilding. The other important idea is waste equals food. Figure out every opportunity where you can create things out of what was previously there before. In New Orleans, there has been an entire economy based around deconstruction and the reuse of salvage materials and several jobs created from that. There’s a similar economy working in Haiti. But as they relate to the overall green building industry, I think landscape architects have an uncanny ability to know the means to the end of a project and to be able to assist and collaborate with all the folks that have historically not collaborated well. I think that if you have the ability to bring together a multidisciplinary team that can understand technical, social, and ecological ramifications, then you’re in a much better place, and you’re making much more informed decisions. Frankly, I think myself and other landscape architect colleagues working with Make It Right have been able to bridge those gaps and make it more of an intuitive process that leads to a much more informed sustainable solution. I’m very much a proponent of bringing landscape architects into post-disaster situations because it’s just what we’re taught. The process of our education and design is a collaborative one and it proved to be a very good foundation for my experiences in Greensburg, New Orleans, as well as Haiti.